Prefab homes are a blessing to all of use due to the extensive need of going green. Prefab homes are pre-built homes – the construction is done in a factory, instead of on-site construction. lets see, how to build a prefab home step by step process . 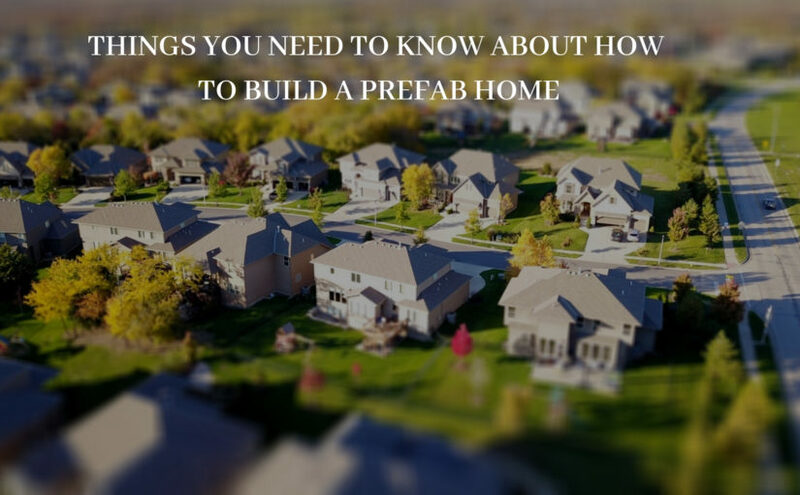 prefab house is built in a controlled environment, saving time, money and other resources.However, building a prefabricated house is a process which needs intense planning and preparation. More importantly, detailing is the key – Helps the prefab structure build better. It all starts with an idea – you are in need of change or bigger spaces or you just suddenly feel the need to work on your home. Ensure you give prime focus to the needs of your family and not change their way of living too much. Pick prefab home options which are similar to your current house unless, all of you agree upon changing the house structure, rooftop etc. Then, find out your house’s floor area, get a rough budget. This is a very basic step and the cost mostly depends of the prefab house builder because of their service charges, technical installation, location issues, interiors and more. If money is an issue, reduce your floor area- you’re all set then! Builders are trained to be special and ensure proper special solutions which shall help the functionality of your home do much better! Your manufacturer must work on the groundworks and foundations – that’s out of your hands, definitely your builder’s job! Contact the right professionals for help – plumbers, water service providers, electricity etc. Once you’re set with the planning, comes the execution. The building process is very fundamental and it’ll go on for 4 to 12 weeks. This phase is a lot about visuals, designing, effective communication and more. While designing with the prefab houses, ensure your engineer keeps the right space for plumbing, electricity connections and other facilities. Good timing is the key here. Plan out the foundation well enough with your builder. The shape and size of your house needs to be set up here. Ensure the site is clear from any issues. The production is a short stage but, is very quick! Attention to quality, superior detailing and related aspects are essential while preparing the site and go about the production in accordance with it. The house is assembled on-site. Therefore, time is essential and time taken varies on the basis of the degree of manufacturing and size of the house. A single-family modular prefab house can be assembled in 2 days while a house that’s made with similar elements might take up to one week. Once the structure of the house is up, the assembly Team of the Manufacturer will leave and the site will be left in the hands of the prefab builder who shall coordinate the works of the Companies executing the technical installations. Typical installations include plumbing, electricity, ventilation, heating, communications. This step can get tricky so, beware! Depending on the size of the house and the level of the finishes, this stage can take anywhere between two weeks and a few months. It is important that finishing works are executed with no rush and great care. In fact, even if the structure of the house is perfect, poorly executed finishing works might result in cracks on the walls and other unpleasant surprises. Final inspection takes place here, housewarming and other events as well! Guarantee may be provided by your prefab house builder and it’s ready to live in once approved! Fixed materials and budget: factories buy bulk materials, generally resulting in cheaper prices of the finished prefab product. Summing Up, Prefab Homes are Beautiful – Live in the most affordable, beautiful and amazing homes ever!